The OSU Trysting Tree is actually a bit of a reincarnation. In 1987, the original tree was cut down due to advanced disease found in its limbs and trunk. 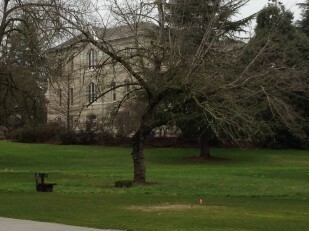 Prior to its removal, one of several cuttings was rooted near the location of the original tree. At some point in 1901, the parent gray poplar apparently received its name when OSU President Thomas Gatch admonished two students for meeting there regularly for romantic purposes. It is believed the original tree was planted between 1880 and 1885 by George Coote, a Horticultural College faculty member. Located within a National Historic District southeast of Benton Hall, the tree is a widely recognized symbol of OSU. The Trysting Tree Lounge in OSU’s Memorial Union also memorializes the tree. Tree lovers everywhere are invited to attend the statewide dedication, slated for Friday afternoon, April 6, 2012. Exact time and location of the dedication will be announced on our website as soon as all details have been arranged. Other Oregon Heritage Trees to be honored this year include: The historic Shipley-Cook Grove, Lake Oswego; the Tub Springs Sugar Pine, Ashland; and the Smokejumper Pine, Cave Junction.